The Spurs, because they are the all-consuming, unrelenting Spurs, did everything they were supposed to in their Game 1 matchup with the Thunder last night. With Serge Ibaka off the floor, they put their heads down and attacked the rim over and over again, scoring 66 points in the paint. They were in control for the entire game, save for one stretch during the third quarter when Kevin Durant and Russell Westbrook launched a fiery and evanescent counterattack, giving us all a glimpse of what is probably the Thunder's best and riskiest chance at winning this series. The Thunder began the third quarter down 70-59, and over the next eight minutes Westbrook and Durant combined to score every single one of the Thunder's points, giving the team a 78-77 lead. It was an incredible thing to watch. Westbrook was grabbing the ball in the backcourt and warp-driving his way straight to the rim every chance he got, and Durant was sniping from distance with his usual cold-eyed efficiency. KD and Russ were playing a loose and deadly brand of basketball, and the Spurs were looking old and overmatched. Of course, Westbrook and Durant's blitz was only successful because during that same stretch Scott Brooks decided to keep his best defensive unit on the floor, sending Nick Collison, Kendrick Perkins, and Thabo Sefalosha out to accompany his two stars. Perk was able to lock up Tim Duncan; Collison got to the spots he needed to and got in people's way; and Sefalosha swarmed the perimeter with Westbrook and Durant. For eight minutes, the Thunder defense harassed the Spurs with such speed and energy that San Antonio's offensive rhythm was thrown completely off-kilter. There's a particularly troubling rub with that defensively stout Thunder lineup, though, and it goes like this: Nick Collison, Kendrick Perkins, and Thabo Sefalosha combined to score five points in Game 1. When this lineup is on the floor, the Thunder are in essence forced to play 2-on-5 on the offensive end. That strategy worked for a bit thanks to the dual brilliance of Westbrook and Durant, but the two stars had to run themselves ragged to get those points. Brooks attempted to get them some offensive help by going back to his small lineup throughout the rest of the game, but the Spurs just went back to punching holes in the Thunder defense. So now Brooks is saddled with a catch-22 of sorts: Does he play his big lineup and ask Westbrook and Durant to be superheroes for 48 minutes, or does he pray that his small lineup can find a way to protect the paint? Neither option is ideal, but at least the former puts his team's fate in the hands of his superstars. That's usually not a bad place for an NBA team to find itself, but the Spurs have been spitting in the eye of anyone who utters "it's a superstars' league" for a decade now. 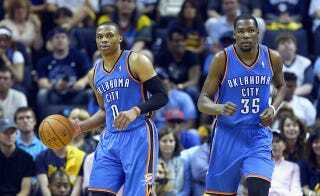 Durant and Westbrook are two of the brightest in the league, but the Spurs are a damn black hole.